The KidCenter #2 is a fun commercial playground structure for Pre-Schools. 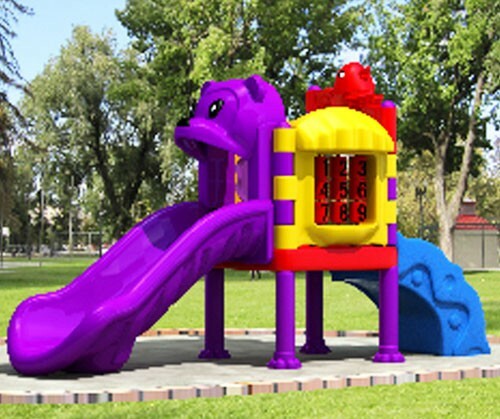 This cool new play system includes a slide, multiple game panels, and a climber all in one affordable unit! Kid Center 2 is an easy to assemble and affordable unit for your Pre-School! The KidCenter #2 is a fun commercial playground structure for Pre-Schools. This cool new play system includes a slide, multiple game panels, and a climber all in one affordable unit! Kid Center 2 is an easy to assemble and affordable unit for your Pre-School! This bright and colorful unit is made of a heavy duty plastic that includes UV protection for years of use! The structure size of this unit is 10' x 5', requiring protective surfacing for a zone of 22' x 17'.